1. Apply liberally to desired area and allow to soak for one minute. 2. Use cleaning tool of choice to remove fouling. 3. Dry with a microfiber cloth. 4. 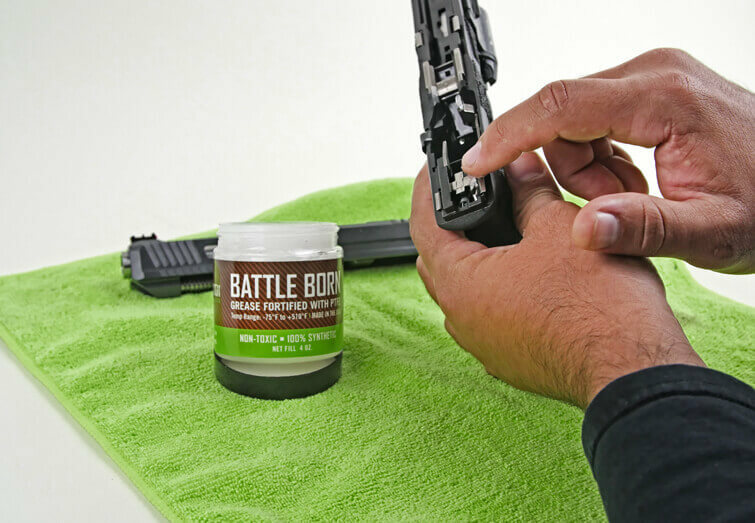 Recondition firearm with Battle Born lubrication products. 1. 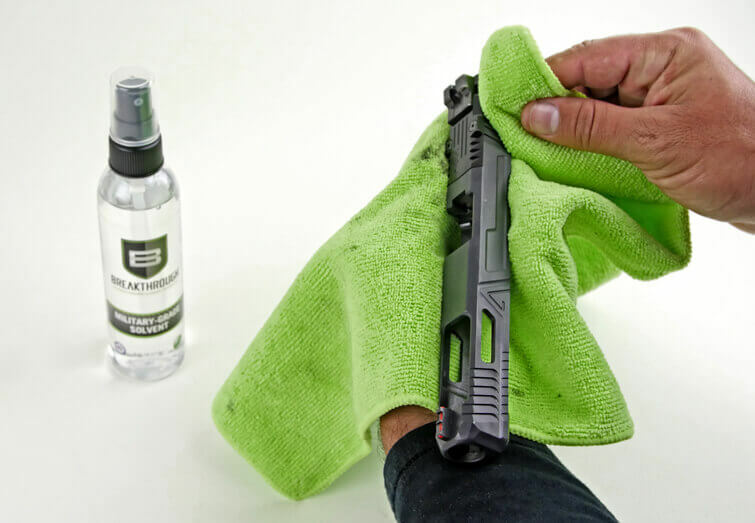 Prior to application, use Breakthrough® Military-Grade Firearm Cleaning Solvent to remove any old grease and/or residue in areas where Battle Born High-Purity Oil is to be applied. 2. Apply a thin layer of Battle Born High-Purity Oil to metal surfaces where friction and wear are expected and allow 10 – 15 minutes for the oil to penetrate and bond to the metal. 3. 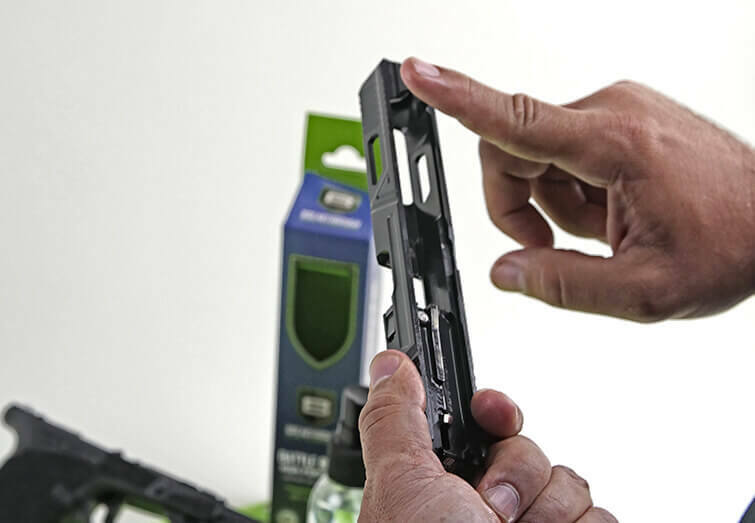 Apply additional thin layers for supreme metal conditioning, protection and lubrication. 1. 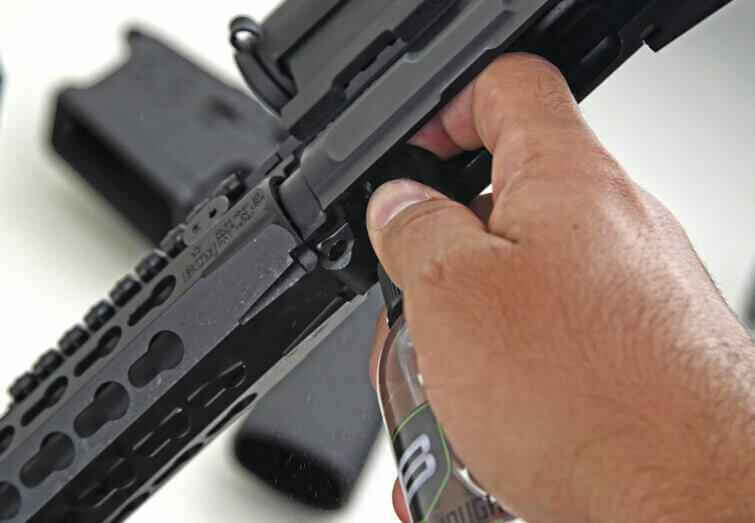 Prior to application, use Breakthrough® Military-Grade Solvent to remove any old grease and/or residue in areas where Battle Born HP PRO Oil is to be applied. 2. 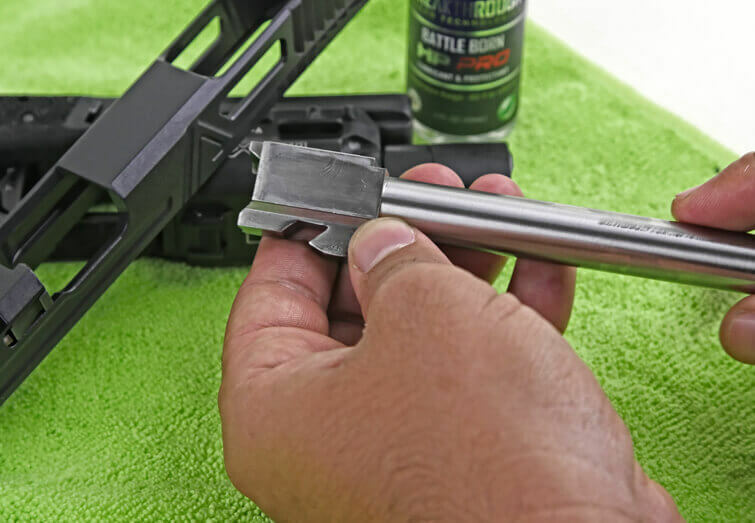 Apply a thin layer of Battle Born HP PRO Oil to metal surfaces where friction and wear are expected and allow several hours for the oil to penetrate and bond to the metal. 3. Apply an additional thin layer of Battle Born HP PRO Oil for supreme metal conditioning, protection and lubrication. 1. 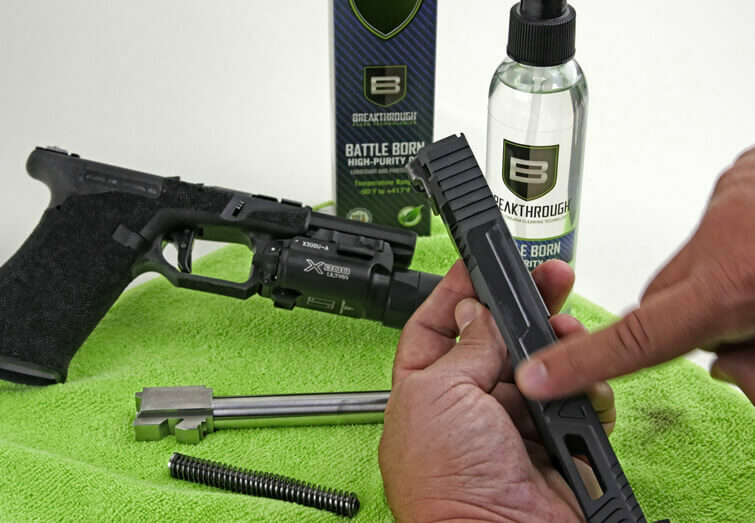 Prior to application, use Breakthrough® Military-Grade Solvent to remove any old grease and/or residue in areas where Battle Born grease is to be applied. 2. Apply Battle Born grease to desired areas. 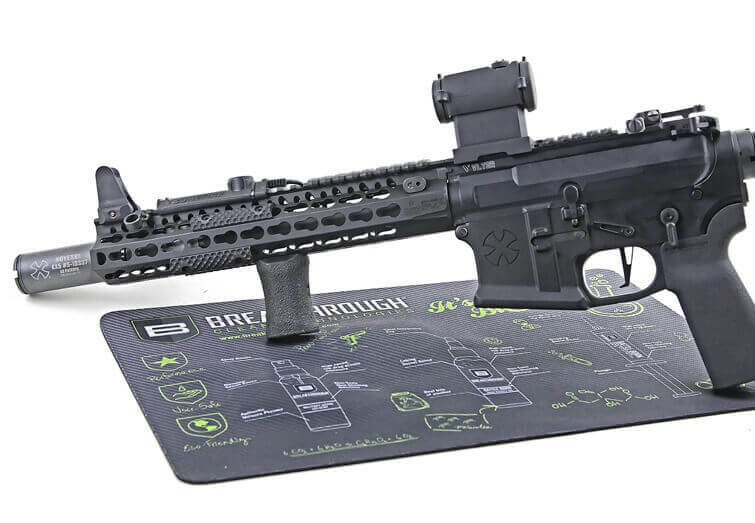 1 - Make sure firearm is cleared and made safe prior to disassembly. 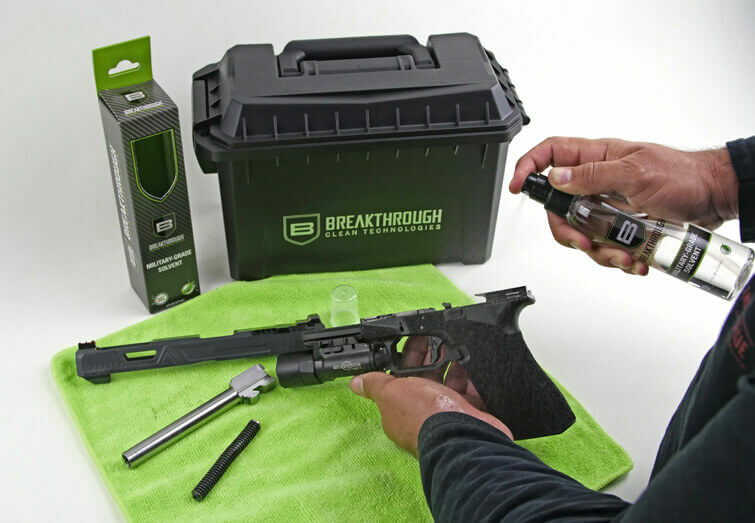 2 - Spray Breakthrough Military-Grade solvent down the bore and allow it to soak for 2-3 minutes. 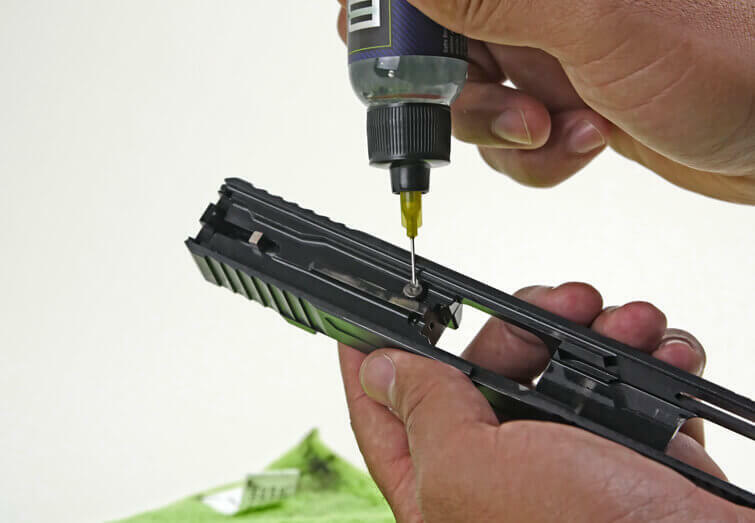 3 - Soak the bore brush with Breakthrough Military-Grade solvent and run it down the bore passing it through several times in order to loosen fouling. 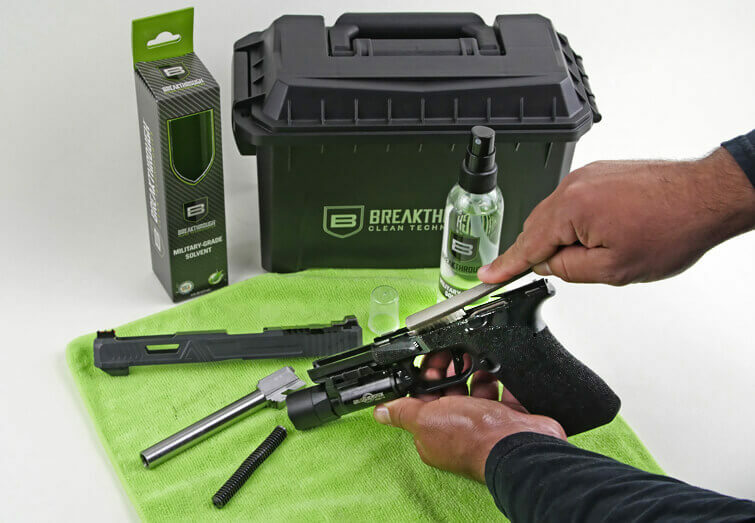 4 - Soak a patch with Breakthrough Military-Grade solvent and run it through the bore. 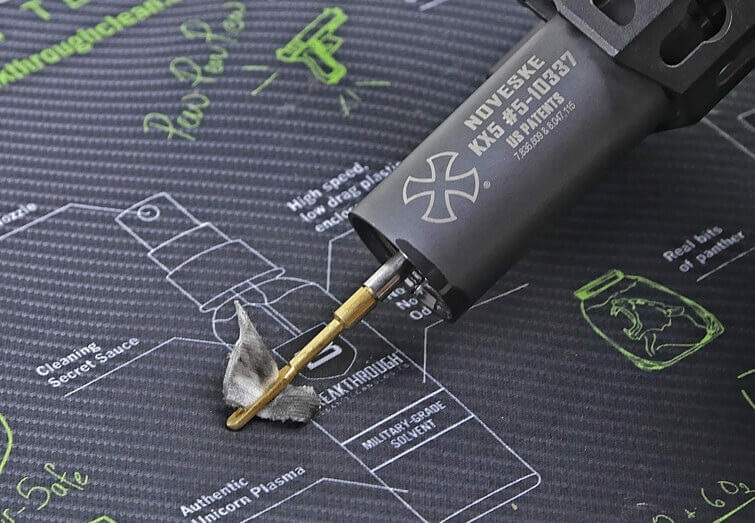 5 - Run a dry patch or patches through the bore until the patch comes out clean. 6 - Repeat steps 2 thru 5 two more times. 7 - Saturate two (2) cotton patches with Breakthrough® Clean Copper Remover and pass them through the barrel. Allow to soak for 3-5 minutes in the barrel. 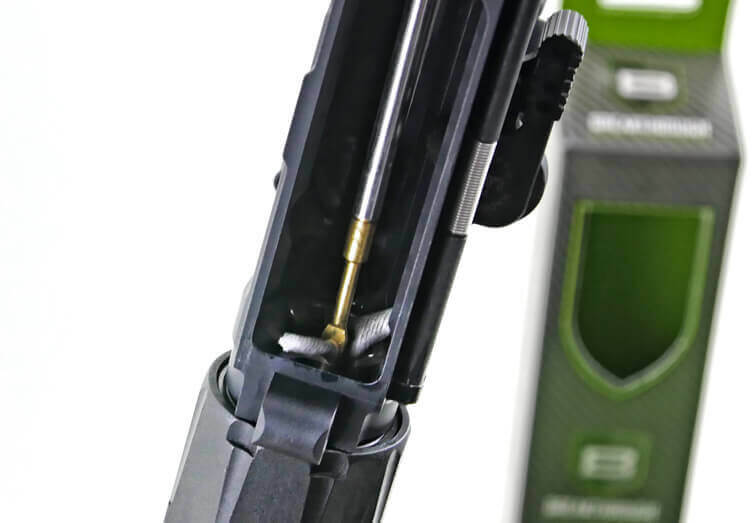 8 - Wet a nylon brush with Breakthrough® Clean Copper Remover and stroke the inside of the barrel 6-8 times. This is followed by another (1) wet patch and then two (2) dry patches. 9 - Repeat Steps 4 thru 5 until bore is clear of fouling and patches come out clean. 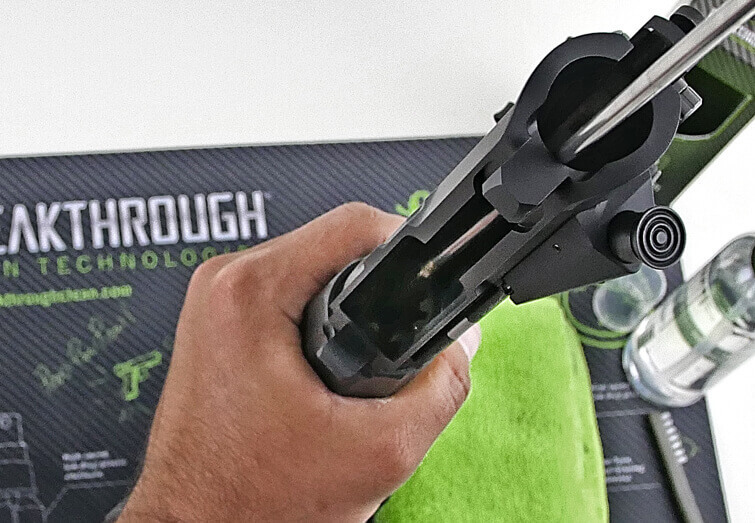 10 - Soak a patch with Battle Born High-Purity oil and pass it through the bore to condition and protect the bore (this lubrication option is only recommended for storage reasons since the solvent is pH neutral and will not harm the barrel after it has dried). 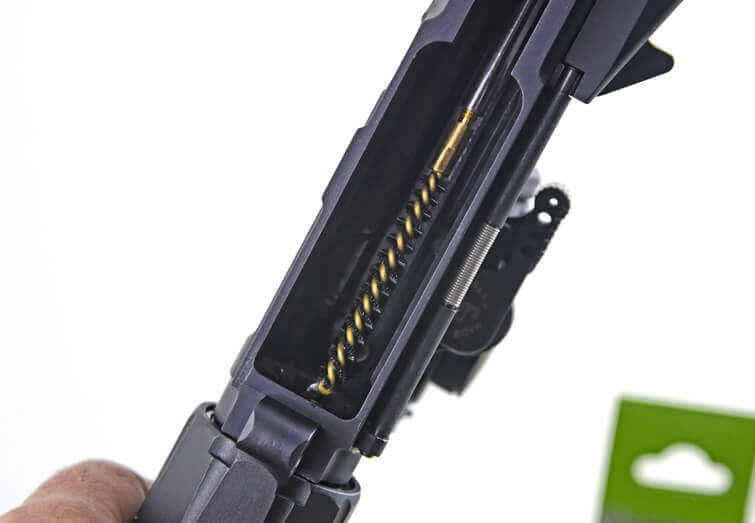 1 – Make sure the firearm is unloaded and made safe. 2 – Saturate two (2) cotton patches with Breakthrough® Military-Grade solvent and pass them through the barrel to remove the loose powder fouling and carbon. 3 - Wet a nylon brush with Breakthrough® Military-Grade solvent and stroke the inside of the barrel 6-8 times or as needed to loosen fouling. This is followed by another (1) wet patch and then two (2) dry patches. 4 - Saturate two (2) cotton patches with Breakthrough® Clean Copper Remover and pass them through the barrel. Allow to soak for 3-5 minutes in the barrel. 5 - Wet a nylon brush with Breakthrough® Clean Copper Remover and stroke the inside of the barrel 6-8 times. This is followed by another (1) wet patch and then two (2) dry patches. 6 – Repeat Steps 4 thru 5 until bore is clear of fouling and patches come out clean. 7 – Saturate one (1) cotton patch with Battle Born High-Purity Oil and pass it through the barrel to leave a light protective coating. Make sure Firearm is unloaded. Spray Breakthrough® Military-Grade Solvent liberally into the bore and on the front section of the thicker part of the rope closest to the weighted brass end. Feed the brass weighted end into the barrel all the way out the front and pull the Battle Rope™ firmly through the barrel until the entire Battle Rope™ comes out the front of the barrel. Apply Battle Born High Purity Oil liberally on the front and back sections of the rope. Put the Battle Rope™ into a small bucket with some Dawn® liquid dish soap in hot water, swishing it around for a few minutes. Then rinse and hang to dry.